If you, like more than 70 percent of homeowners, use the garage door as your main entry, then you’re giving it a daily workout: up, down, up, down, up, down. With all that activity, the biggest, heaviest door in your home—much like the human body—needs regular checkups and maintenance. 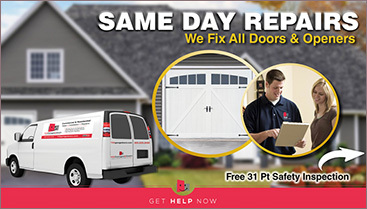 If your garage door starts grinding, bouncing or refusing to raise or lower, the door could inflict bodily harm and/or jeopardize your home’s safety and accessibility. It’s time to call in the experts. Plus, no work begins until we’ve completed our 31-point inspection, and discussed our recommended repairs and their cost with you. If you agree to move forward, we can typically complete the job that day. While we’re always delighted to come to your home in New Jersey and assist you, you may be able to manage some small fixes on your own. Below is our step-by-step guide to common garage door problems. Of course, feel free to call if you need help over the phone or if you’d like a service technician to do the job for you.